The melt down in Detroit has claimed another victim; Saab. 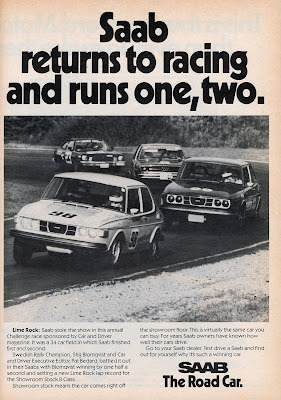 While we greave, let us remember the good times when Saab was a young vibrant company as Swedish as a plate of pickled herring. In post war Scandinavia, automotive options were few. If you needed front wheel drive, low drag aerodynamics and like the smell of two-strokes the choice was clear: Saab 92. The tiny two cylinder engine was water cooled but did without a water pump and sat in front of the radiator. The powertrain was mounted transversely, a common layout today that was peculiar in the 1940's. Peculiarity set real Saabs apart. Then they got in bed with GM and then, well let us remember the good times. Peculiarity made Saabs endearing. While every other manufacturer blindly went along with the notion that the ignition switch belongs on the steering column, Saab thought otherwise. While others considered cross-overs innovative Saab brought us asymmetric turbos, active aerodynamics, variable compression, and cross-wheel drive. We'll miss Saab not because its the preferred automobile of liberal academics, but for the quirky Scandinavian machines it put on the road.